The First Judicial District Commission of Judicial Performance unanimously recommends that Judge Tammy Greene BE RETAINED. 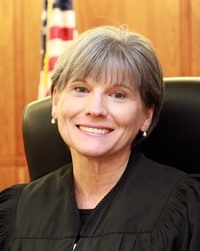 Judge Greene was appointed to the Jefferson County Court in 2008. Prior to this, Judge Greene was a part-time municipal court judge, a part-time municipal court prosecutor, and in private practice. Judge Greene received her BA from the University of Tulsa and her law degree from the University of Illinois. She currently handles the civil division of the county court. Her community involvement includes teaching courses to judges, attorneys, mediators and court clerks; judging high school mock trial competitions; mentoring DU law student judicial interns; participating as a member of the Colorado Institute for Faculty Excellence in Judicial Education Planning Committee; participating as a member of the 1st Judicial District Access to Justice Committee; participating as a member of the County Court Civil Rules and Reform Committee; participating as a member of the Jefferson County Mediation Services Advisory Board; and, participating in 1st Judicial District Bar Association Activities. The Commission considered responses to anonymous surveys sent to attorneys and non-attorneys who have been in Judge Greene’s courtroom, unannounced courtroom visitations by Commission members, a self-evaluation by Judge Greene, a personal interview by the Commission with Judge Greene, written opinions of Judge Greene, and other information. Of attorneys completing the survey, 80% recommended to retain, 13% had no recommendation, 3% somewhat recommended she not be retained and 5% recommended not to retain. From the survey of non-attorneys 77% recommended to retain, 6% had no recommendation and 16% recommended not to retain (these percentages may not total 100% because of rounding). Judge Greene scored well among attorneys and non-attorneys for case management, knowledge and application of the law, communications, demeanor and diligence. Based upon its review of the information presented to it, the First Judicial District Performance Commission is pleased to recommend unanimously that Judge Tammy Greene of the Jefferson County Court BE RETAINED.